Open every days from 4.00am to midnight. You can park on one of the three public car parks: P1 has 165 spaces, P2 has 70 spaces and P3 has 690 spaces. All three car parks operate in the same way, at the same price. They are enclosed but not covered. 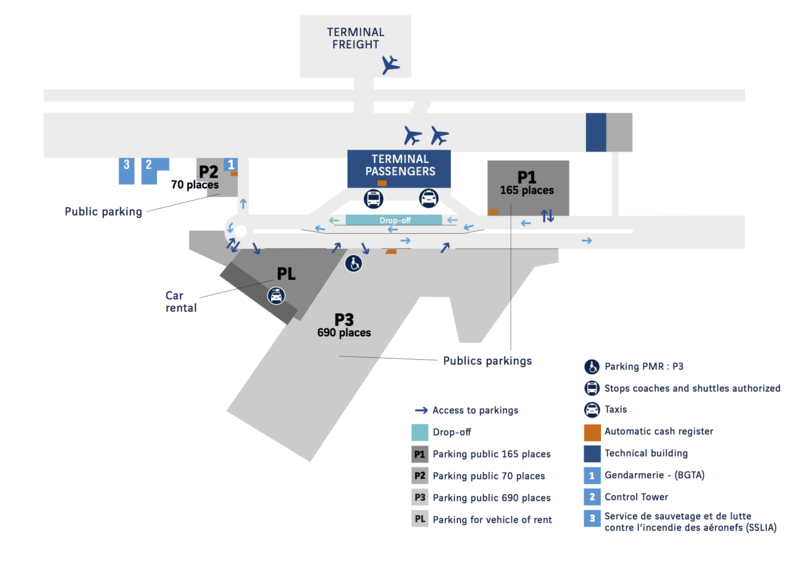 payment machines located on car parks P1 and P3 and in the terminal building. By cash : at the automatic payment machines on car park P3 and in the terminal building. Charges applicable as from 15/06/2015 and subject to changes and updates. D-30 online rate is available for bookings made at least 30 days before departure and are valid for a period of minimum 3 days parking only. Terms of withdrawal below. Following your booking of the D-30 online rate, you must present yourself at the reception of the terminal of Rennes at the return of your trip. On presentation of your confirmation e-mail (or downloadable booking voucher), your entrance ticket to the car park, your return tickets and your identity document, you will be given a ticket applying the D-30 online rate (subject to compliance with the conditions of application). The reception staff will give you the details of the payment on the spot. A frequent-flyer rate is offered to regular airport users and to passengers leaving their vehicles over a very long period of time. To benefit from frequent-flyer rate, payment must be made before departure at the Information Point located in the arrival hall. €6 extra cost at the creation of your subscription card. Payment must be made before departure at the Information point located in the arrival hall.